The Manoir-de-Verdun Residential Centre was merged with other centers of the territory, the CLSC’s and the Hospital of Verdun into a collective entity called the University Integrated Health and Social Services Center of the Southwest of Montréal. The city of Verdun, through the efforts of its mayor and the council, initially started the Manoir-de-Verdun construction project, a public reception center for seniors in Verdun. Inaugurated in July 1970 with a capacity of 225 beds, the establishment was invited in 1981 by the Regional Council to present a redevelopment project to better meet the increased number of customers. 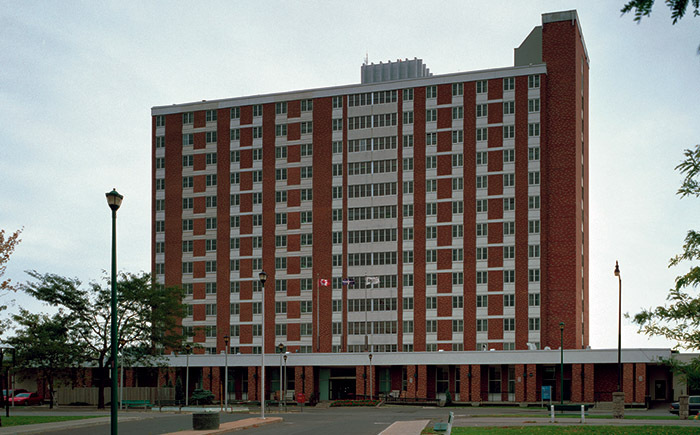 Beginning in January 1989, in anticipation of future major works and to avoid transfers to other establishments, users are grouped on 5 floors, bringing the number of temporarily available beds to 130. The work began in January 1994 and included the complete renovation of the building with additional space for hygiene services (central organization of bathrooms), the development of a new dining room for 20 places on each floor and finally additional spaces for community and rehabilitation activities (physiotherapy and occupational therapy). The Manoir-de-Verdun Residential Centre now offers 220 private chambers. The work was duly completed in February 1996. To offer the services of the Day Centre to an external clientele and since a few years ago, the centre offers hemodialysis services. The organization supports and participates in activities promoting health and collaborates with educational institutions to train health and social services workers and to support the success of clinical gerontological-geriatric research projects. The geographic territory that is served is the southwest district of Montreal, namely: Verdun, LaSalle, Ville-Émard, Côte Saint-Paul, Pointe-Saint-Charles, Saint-Henri, Lachine and Ville St-Pierre. The Manoir-de-Verdun Residential Centre currently has 220 beds for long-term accommodation and one Day Hospital and hemodialysis services. Certain service fees including those related to hairdressing, podiatry, telephone and cable are assumed by the users or their respondent. The center’s staff offers free laundry service, however washers and dryers are available to users or their respondent if they wish to do their own washing. Should the users or their family prefer using the services of an external laundromat, they must assume the fees.